GTC Munich 2018 has proved to be NVIDIA’s largest European event to date with more than 3,500 attendees! As the most accredited Elite partner in northern Europe, Boston are always in attendance as this is the premier AI event of the year. Not only were visitors excited about the exhibitions, but autonomous cars, virtual reality demonstrations, training sessions and over 150 talks from educational institutes, research companies and start-ups were also available to provide a jampacked schedule. Furthermore, NVIDIA hosted over 76 hours of training from their Deep Learning Institute and we were pleased to provide our accredited DLI instructor to assist! Click here for more on our Deep Learning Fundamentals Course. Continue reading below for more on NVIDIA CEO Jensen Huang’s Keynote announcements, Awards, Stand Solutions, MU-VR in the VR Village and more. Before the official GTC event commenced, NVIDIA hosted a special event for Key EMEA partners. Led by key NVIDIA personnel, the sessions and seminars included updates on what’s new in the industry, successful user cases and partner support followed by dinner and awards. Click below for more information on our NVIDIA Partner Assets or visit our NVIDIA Partner Page for more on the most accredited European partner. Boston Wins NVIDIA Tesla Partner of The Year Award! We are pleased to announce that Boston Won NVIDIA Tesla Partner of The Year Award! Huge thank you to our Account Manager and other key NVIDIA members for the continued support throughout our several years of partnership. We’re looking forward to many more successful years together. Pictured (Left to Right): Richard, VP of Partner Organisation. Alan, NVIDIA Enterprise Partner Business Manager & Manoj, Boston Managing Director. NVIDIA CEO, Jensen Huang, is well-known for captivating keynotes with live demonstrations, new product announcements and tech humour - GTC Munich 2018 was no different. This is an open-sourced GPU-accelerated platform to give companies working with Big Data a huge competitive advantage. Paired with the DGX2, RAPIDS for predictive analytics provide savings over CPU based racks by using 1/8th of the cost, 1/15th of the space and 1/18th of the power! While displaying their advancements, Jensen showed how their newly developed RAPIDS with a DGX-2 changed a Data Scientists workflow in a beautifully illustrated timeline (as seen above). In summary, the Data Scientist significantly lowered waiting times and produced more data in a shorter amount of time! NVIDIA Drive AGX is a scalable, open platform that works as the AI brain for self-driving vehicles. Over 20 vehicles powered by NVIDIA Drive were on show at GTC; from driverless cars, taxis and trucks to a street sweeper. So what better place to announce that the AGX software and developers kit is now available than Munich! Volvo and Continental were two of many companies to announce the adoption of NVIDIA’s Autonomous driving solution for their next round of development. Discover more on NVIDIA's automotive highlights. Cloud Computing at your fingertips. From Broadcast to Deep Learning and CFD, vScaler has a solution for various workloads. 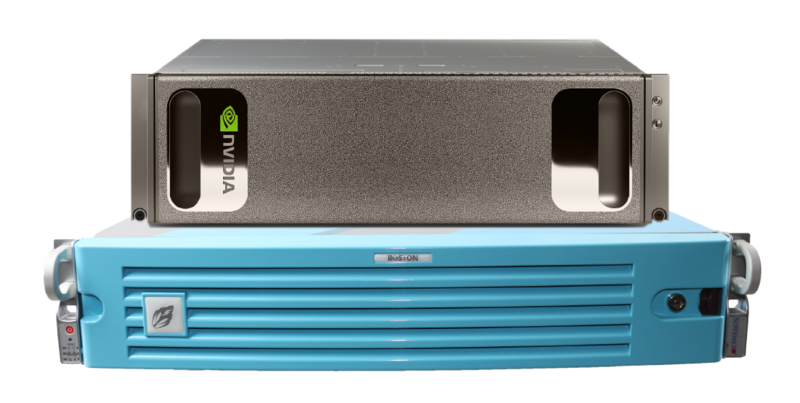 Our Boston Flash-IO Talyn enables shared access to its NVME flash storage with low latency and high-performance as required by GPU-based applications. Together with NVIDIA’s DGX-1 in a converged solution, you can achieve unparalleled performance. Talk to our team regarding Boston Labs testing and benchmark scores! One of the highlights of GTC featured the Roamer MU-VR solution in the VR Village! 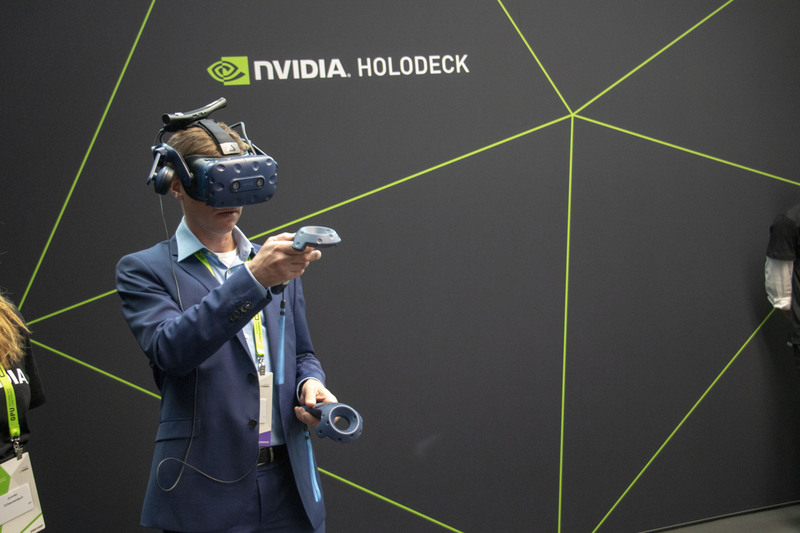 The wireless, 3-user version demoed at GTC Munich 2018 featured NVIDIA’s Holodeck and a guide to take you through this amazing technology. Click here to discover more about this turnkey solution. 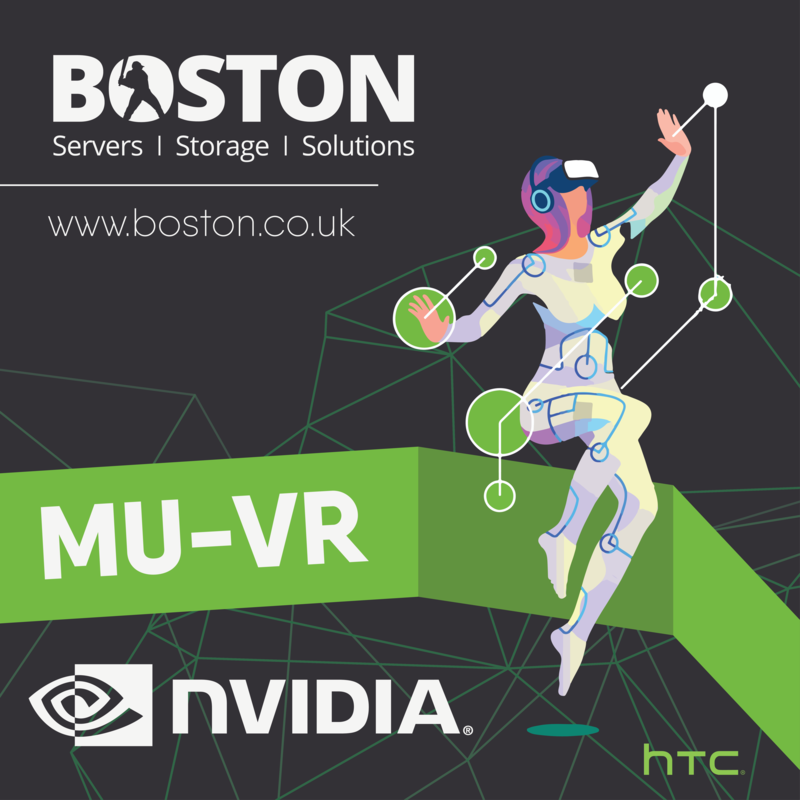 Boston’s Roamer MU-VR solution was our highlight from the VR Village while demoing NVIDIA’s Holodeck. The photorealistic, collaborative design VR engine transported attendees into a virtual dimension where they were able to draw in 360, separate parts of the car from its body and achieve other amazing features. The wireless HTC Vive Pro’s with NVIDIA P6000 GPUs provided lossless quality and minimal latency with movie-quality graphics while roaming untethered in the holodeck. Testing Is available in both our UK and German offices so get in contact for more information! Huge thank you to our GTC Europe 2018 sponsors who made this possible! 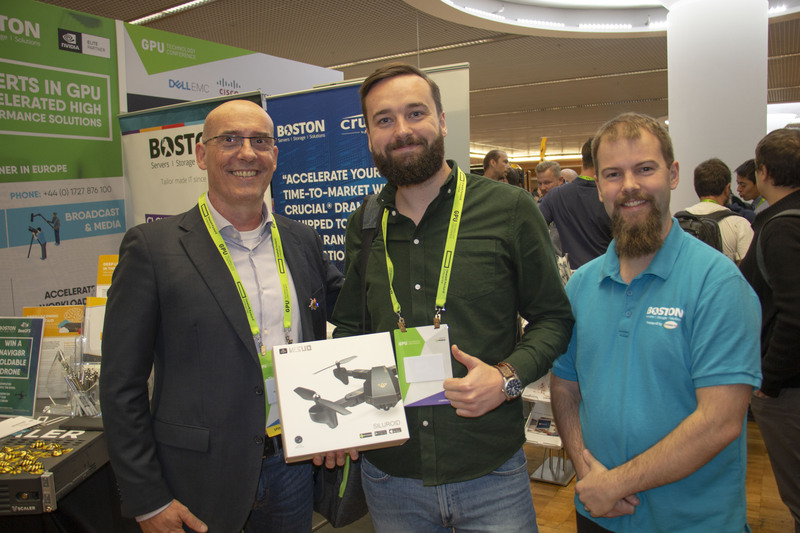 And congratulations to Tomasz who took home a Navig8r Foldable Drone as part of our BeeGFS sponsored Competition! Pictured (Left to Right): Marco, BeeGFS. Tomasz, Competition Winner & Matt, HPC Commercial Manager. Micron offers the industry's broadest portfolio of silicon-to-semiconductor solutions-starting with the foundational DRAM, NAND, and NOR Flash memory, and extending to SSDs, modules, MCPs, HMCs, and other semiconductor systems. Our longest standing partner, Supermicro is a global leader in high-performance, high-efficiency server technology and innovation is a premier provider of end-to-end green computing solutions for Enterprise IT, Datacenter, Cloud Computing, HPC and Embedded Systems worldwide. The BeeGFS® parallel file system was developed specifically for performance-critical environments and with a strong focus on easy installation and high flexibility, including converged setups where storage servers are also used for compute jobs. 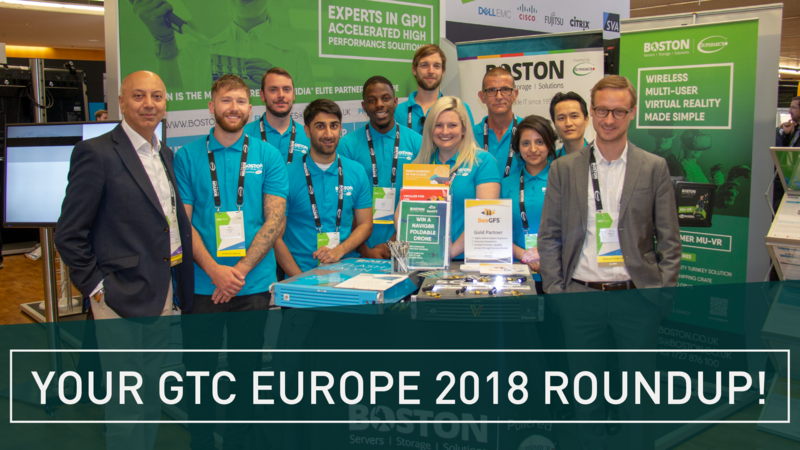 Click below for our FLICKR pictures from GTC Europe 2018 and other events! Request a callback or Stay up-to-date with the latest product releases, news and events from Boston!